The Nancy T. Hansen Theatre is a 300-seat proscenium theatre. This state-of-the-art facility was designed to provide an intimate audience relationship. The theatre is only 12 rows deep and terraced seating provides maximum visibility of the stage. Loeb Box Office / Stewart Center is open weekdays from 10:00 a.m. to 6:00 p.m. Summer hours are 10:00 a.m. to 4:00 p.m.
Yue-Kong Pao Hall Box Office is open weekdays from 10:00 a.m. to 4:00 p.m. Closed after the first week of May and reopens the first day of PU classes fall semester. 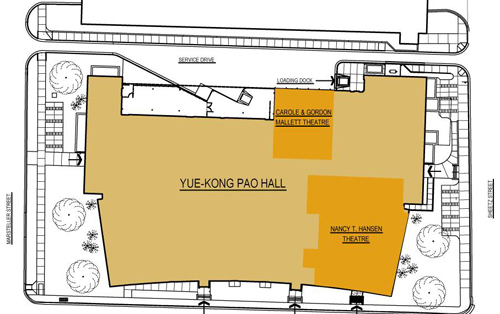 Upon fall semester end, Yue-Kong Pao Hall Box Office is closed from finals week until spring semester begins. PU Spring Break week this box office is also closed. On Performance days, the Pao Hall Box Office is also open Friday day of performance from 6:00 p.m. to 8:00 p.m., and Saturday day of performance from 12:00 p.m. to 2:30 p.m. and 5:30 p.m. to 8:00 p.m. Parking is free on weekdays after 5:00 p.m. and on weekends. Spaces are available in the front lot of Pao Hall and on side streets by Pao Hall. For weekday parking 8:00 a.m. to 5:00 p.m., the Grant Street parking garage is within walking distance of Pao Hall; an hourly fee is charged. Wheelchair seating is available with adjacent companion seating and should be requested when ordering tickets. Handicap parking is available in the front lot of Pao Hall. Hearing amplification headsets are available free of charge from the House Manager prior to every performance. Devices should be returned to the House Manager or an usher after the show. The theatre is open to the public about 30 minutes prior to each performance. Late-arriving patrons may be asked to wait until they can be seated at the House Manager’s discretion. Parents with babies are required to purchase tickets near the exit doors.